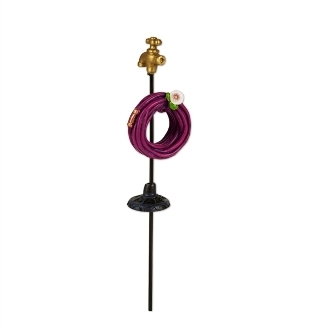 Garden Hose and Spigot for Merriment Mini Fairy Gardening. Full Description: Sprinkle your mini garden with love using this mini garden hose stand. Features all-weather paint. Made of resin with metal pick. Welcome to the world of Merriment! This mini-garden collection by artist Mary Engelbreit features fairies, with their own unique interest, hopes, and dreams. They live in special places where imagination flourishes and your creativity thives with thoughtful and beautiful fairy garden accessories. We are excited to have Mary Engelbreit's Merriment Collection to be featured at the Fairy Garden Store.Com!